It’s fall now. I wake up to bright yellow leaves contrasted against a backdrop of gray skies, the patter of rain and a chill in the air. I’ve got pine-scented candles burning and I’ve pulled extra blankets out of the closet. I’m anticipating a higher electricity bill, but for now I’m keeping it off and saving the money for boots. A girl’s gotta have new fall boots. It’s the time of year when the farmers markets are full of squashes and apples in dozens of varieties. It’s the time to sip warm drinks like cocoa and pumpkin lattes and mulled wine. At work we’re sneaking pumpkin into everything from doughnuts to cookies to ice cream. It’s the season for indulgences. And I’m participating in a 30-day diet for the entire month of October. I didn’t think it was possible. I thought for sure that I would cheat. But I’ve done it. I haven’t eaten any sugar for two weeks. None. Zero. Zip. No honey, no maple syrup, no agave even. The only sweet treat I’ve eaten is fruit, and I’m going to keep it that way for another two weeks. You probably don’t want to hear this. I’ve rolled my eyes at plenty of bloggers who have gone “healthy”. But I’ve long supported more nutritious versions of classic treats, substituting refined flour with whole-grain alternatives, using less sugar or choosing natural sweeteners. I love eating food, but I also want to treat myself well, and I’ve always believed the two could go hand in hand. And so I bring you a delicious, nutritious treat fit for fall! If I’d known all this time that applesauce was this easy to make, I never would have bought it at the store. Peel, core and chop the apples, put them in a slow cooker, cover and turn it on. A few hours later: applesauce! It’s magical, and your house will smell amazing. Now add some spices and pumpkin to the mix and you have something truly special. 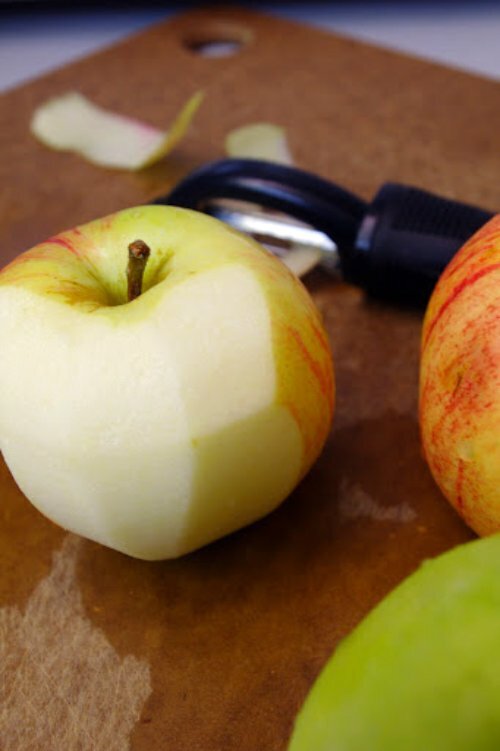 Place the apples in the crock of your slow cooker and cover with the lid. Cook on high for about 2 hours, stirring every 15-30 minutes. (Alternatively, this could be made on the stove top, but would probably needed to be tended more closely to make sure it doesn’t burn on the bottom). Once the apples are mostly cooked down, stir in the pumpkin puree, spice and salt. Leave the slow cooker uncovered and cook another 30 minutes to thicken, stirring occasionally. After everything has cooked down into a smooth sauce, turn off the heat and stir in the coconut milk. 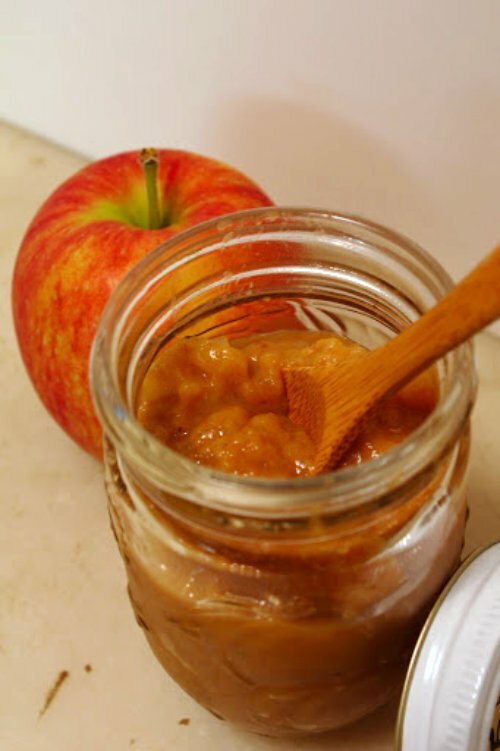 Keep the applesauce in the refrigerator for up to two weeks (though it won’t last that long!) or freeze for longer storage. Serve warm or cold, plain or with some toasted nuts and seeds sprinkled on top (I like the crunchy contrast!). Enjoy! nothing better than apples mixed with pumpkins in the fall. Great recipe, I will give it a try! What a good idea! I love pumpkin even more than apples so this sounds like a winner…And I’ve never thought of putting something creamy in my applesauce…but that’s not really true, because my favorite way to eat apples is cooked like sauce, but in large pieces, with lemony custard sauce on top. ooh la la…but just a little coconut milk would be much better for my waistline! 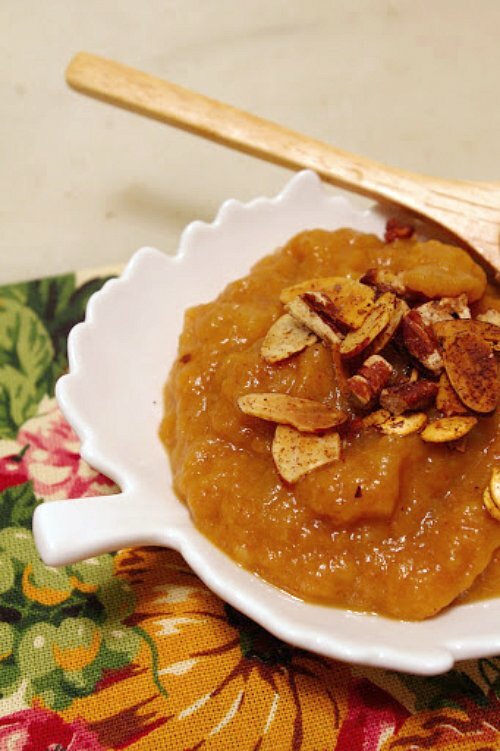 Such an interesting thing to mix pumpkin and applesauce and to add sweetness with coconut milk. I’ll be trying this sometime this fall. Yum….you got plans for Thanksgiving? Oh good for you. Well done and I hope you manage to complete your no sugar diet – not long to go now. 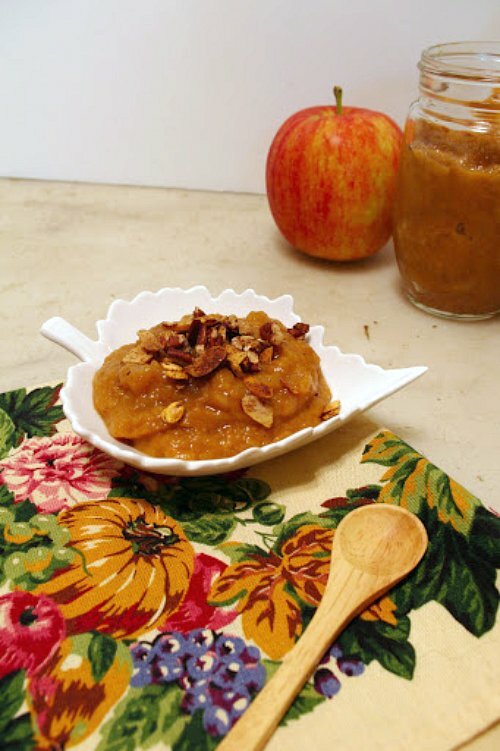 The pumpkin apple sauce sounds delicious especially with the coconut milk addition. I’ve made both pumpkin butter and apple butter before and you reduce them down until they are thick and buttery and naturally sweet. Hope things are going well for you. I’ve missed your wonderful We Should Cocoa entries lately, but I completely understand that life is busy. Thanks Choclette! I’ve got one day left and I’m still going strong. Never thought I could go this long without sugar!